El-Gouna is an amazing Egyptian touristic resort that is famous for its water sports such as scuba diving, snorkeling, water skiing, windsurfing, and many other interesting activities that you can explore with our El Gouna excursions, and that is because it is rich with several beaches that provide all the necessary activities for the guests. 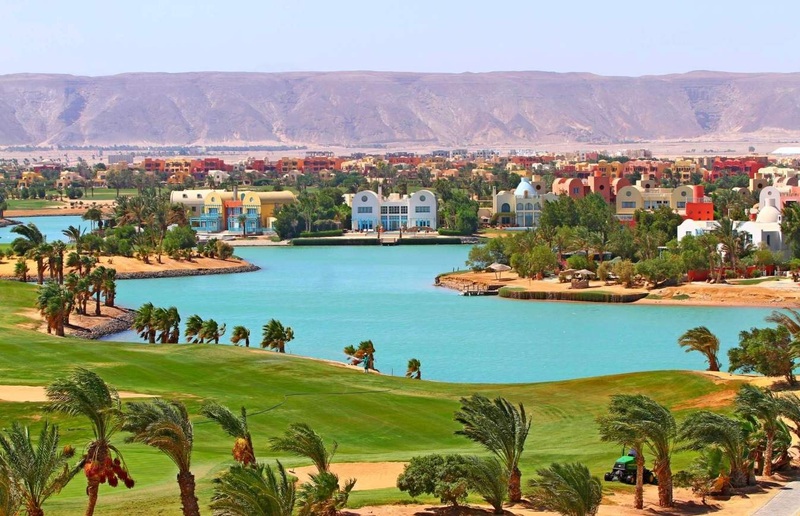 The climate in El-Gouna is called desert climate. It is sunny most of the year. The average temperature is 23.1C. It is located on the Red Sea, 20 kilometers north of Hurghada. It is owned to Samih Sawiris who is an Egyptian businessman and the Executive Chairman of the Board of Directors and CEO of Orascom Development Holding AG. He established this amazing resort in 1989. There are three famous areas in El-Gouna, which are “Downtown”, where you can find a lot of supermarkets, “Tamer Henna Square” which is a terrific restaurant where you can have all of your meals, and the “Abu-Tig Marina” which is now a well-established resort that has its own power stations, hotels, golf course, shops, a school, and an airport. It has more than 18 sumptuous hotels with 2895 rated from three to five stars that offer the best service to their guests. It hosts some Golf Courses, which are the best choice for those who love enjoying the beauty of nature. A totally equipped hospital 24/7 for any medical treatment. This resort also hosts a small airport, an International school, and three marinas; Abydos marina that was established in 1929, the Abu Tig Marina that is the most popular marina in El-Gouna and the Abu Tig Marina Extension that is the most exclusive location for shopping and dining places in El Gouna. A small Museum that contains 90 exhibits. Some tennis courts and a football stadium. House stables, some cafes, and restaurants. A mosque and a Coptic church. How to Enjoy While Being in El-Gouna !! Trips to Cairo from El-Gouna: The most exciting thing to do while being in El-Gouna is visiting Cairo attractions such as Giza Pyramids Complex, The Great Pyramid of Khufu, the unique Sphinx, and of course the amazing Egyptian Museum. “Trips In Egypt” located in El-Gouna Red Sea on Tripadvisor and provides a wide range of tours from El Gouna that covers the best sites in Egypt. Trips to Luxor from El-Gouna: While being in El-Gouna you have to take the advantage through Luxor attractions including The Valley of the Kings, unprecedented Hatshepsut Temple, emphatic Colossi of Memnon and no doubt Karnak Temple. Trips to Aswan & Abu Simbel from El-Gouna: You have to visit Aswan’s highlights to see the true glory of the Egyptian Civilization. There you can visit: the great High Dam, the miraculous Unfinished Obelisk, Philae Temple and it’s a must to visit Abu Simbel Temple because of the fanciful beauty of its massive temples. Trips to Alexandria from El-Gouna: Alexandria is considered to be the bride of the Mediterranean sea with beautiful beaches and lovely landmarks. While being in El Gouna, you can travel to Alexandria to witness the beauty of the Alexandria library, the Catacombs, magnificent Pompey’s Pillar, and the marvelous citadel of Quitbey. Outstanding Nile Cruises from El-Gouna: What is better than having a look at the whole world while being in a Nile Cruise with your family or friends. Scuba diving: El-Gouna is a perfect place for both learners and expert divers. Diving takes you to a bonny adventure to discover another world, a world full of magical creatures and bewitching scenery. Snorkeling Trips: It’s a recreational activity that can be applied in resort places just like El-Gouna. It appeals to all age groups, as it doesn’t necessarily need a lot of effort. Super Safari Trips by a Quad bike: In such a trip, you can combine culture, entertainment, and adventure together as you can have sessions on the desert sand, riding a camel, walking up the hill, and seize the opportunity to see the view of the sunset.